The Great Saint Shri Radha Baba of Gorakhpur never came in light during his lifetime because he believed that a Sanyasi should never publicize himself. Only devotees who were closely associated with Saint Shri Hanuman Prasad Poddar, who was popularly known as Bhaiji came in association with Shri Radha Baba because he always lived with Bhaiji in Gita Garden Gorakhpur. Shri Chakradhar Baba was more popular as Radha Baba and he was a brilliant scholar having proficiency in six or seven languages. He came in contact of Shri Hanuman Prasad Poddar in quest of spirituality through Jai Dayal Ji Goenka who was a spiritual personality and founder of Gitapress. 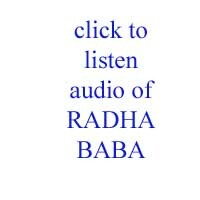 Radha Baba was a follower of Vedant and very much intellectual. But after he came in contact of Shri Bhaiji, he became a Bhakti Margi and staunch devotee of Lord Krishna. He followed the path of Braj Sadhana and worshipped Lord Krishna in the concept of Radha Bhava. In the tradition of Saint Shri Chaitanya Ji, he worshipped by Naam Sadhna and Bhava Samadhi. During his life time he maintained highest austerity, never touched money and kept away all luxuries. This kind of life path he lived was very rare in saints of that time. He took food and water only once in a day during all his life. His spiritual bond with Bhaiji was very strong and people who followed Bhaiji also followed Baba. 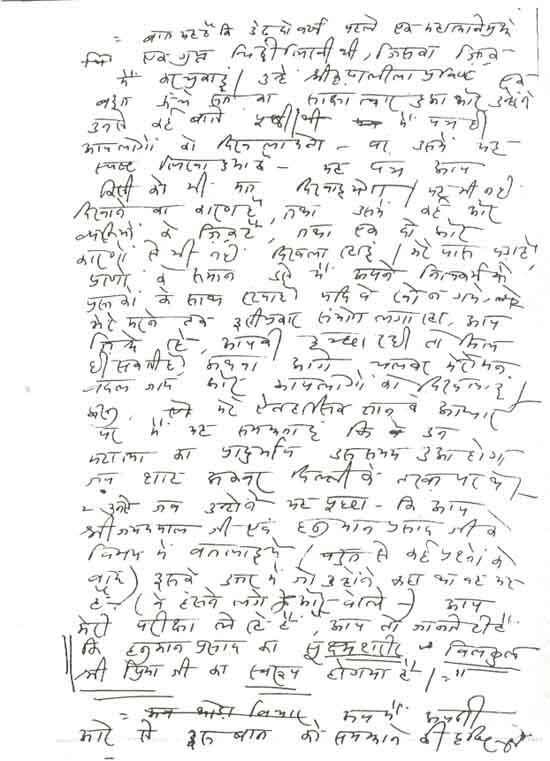 He was an outstanding writer but he never published his name in his books therefore his books were written anonymous or by inscribing Ek Sadhu. He was a wonderful poet and wrote excellent poetry of devotion. During his spiritual journey, in childhood he started worshiping Lord Shiva and after Sanyas he was dogmatic for Vedant. When he met Shri Bhaiji at Gorakhpur his mind set was transformed. But it was not all sudden. He worshipped Tripur Sundari and achieved the highest in that cult. Then he slowly turned into Bhakti Marg and became devotee of Lord Krishna. He used to remain in Samadhi for days without worldly consciousness. He never disclosed his spiritual achievements and never made disciples. He taught Bhagwannam Jap and believed that prayer is the highest spiritual Sadhana a human being can do which is unfailing if done by faith. He ended his life at wish and went into Maha Samadhi after his commitments. The books written by several writers who had been associated with him can never reveal the peaks he achieved in spirituality. He was a Maha Sidha Sant and this was revealed by his contemporary saints. The purpose of this site is to reveal the world the highest spiritual personality, though very little can be described by words. Sadhu Krishna Prem and Shri Radhe Shyam Banka lived with Radha Baba at Gorakhpur for years. The books on this site are written with highest devotion without any egotism and great faith. It might appear exaggerated while reading some events. But they should be taken in the same spirit as writers were highly devoted to Radha Baba. like religious marwari , but the people who were very close knew his highest spiritual attainment. Radha baba wrote that the condition of Bhaiji is just like chaitanya Mahaprabhu and his spiritual self is totally turned into Radha Rani , the beloved of Lord Krishna .This was considered the highest attainment in Bhakti ,but Bhaiji simply belied this by saying in Marwari*Matho Kharab Ho gayo*. It was like a jagrat Samadhi of highest attainment. these books will be recently uploaded. AUDIO LINK FOR BHAIJI AUDIO SPEACHES HAS BEEN PROVIDED. Radha Baba was a symbol of Love, Faith and Truth. Bhakti Marg’s lively example. There is a high where nothing but Brahma exists. Dvait, Advait, Knowledge, Spirituality exists at that high. Shri Radha Baba was that high. 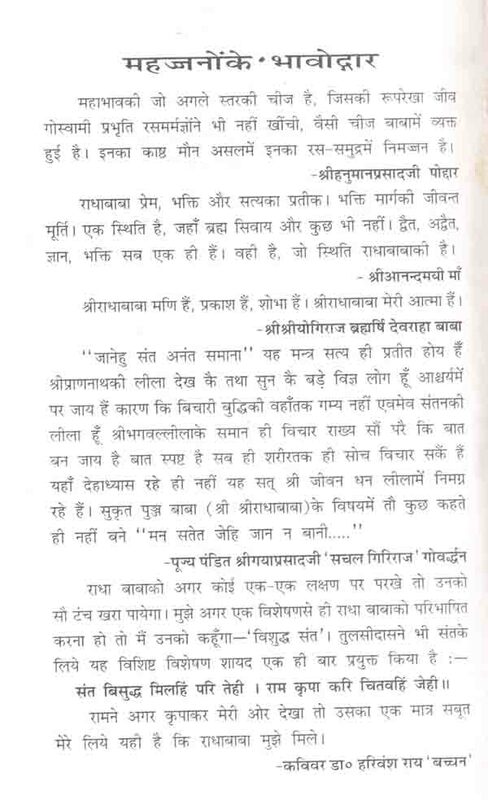 The Great Saint Shri Radha Baba of Gorakhpur never came in light during his lifetime because he believed that a Sanyasi should never publicise himself. Only devotees who were closely associated with Saint Shri Hanuman Prasad Poddar, who was popularly known as ‘Bhaiji’ came in association with Shri Radha Baba because he always lived with Bhaiji in Gita Garden Gorakhpur. Shri Chakradhar Baba was more popular as Radha Baba and he was a brilliant scholar having proficiency in six or seven languages. those who are interested my send their requirement on our email address radhababaofgorakhpur@gmail.com. you can subscribd this site so that new posts are updated to you. the EBook is also available free of cost for every devoted spirutual aspirants. Jai Shree Krishna…the life of the guru is a lesson to be followed and could be an awakening of a life time. Hari anant Hari katha ananta…hriday basey santon k santa…mun mridul manbhavan chavi jyon…karma karein kriya bhi tyon!! Radha baba ko dekhne ka awsar to na paa saka…sadaiv yahi tha man me, ki kaash kuch aur pata chal sakta in mahan vibhutiyon ke bare me….kewal Vatika Vatayan hi ek pustak ne mujhe ek nayi disha di thi….ab aap ne sara gyan aur prem ka amulya bhandar uplabdh kara kar bada upkar kiya hai…aapki bhakti ko shat shat pranaam!! 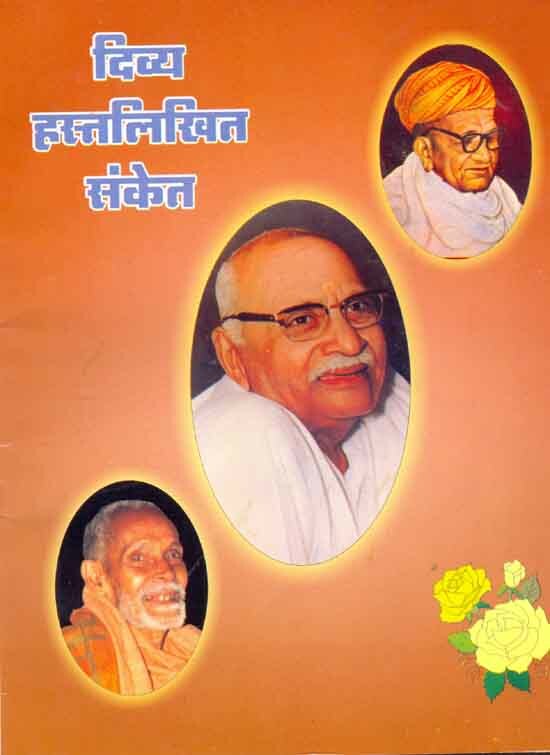 I need each and every information and books about pujya Bhaiji and radhababa. Please send me full details. the maximum books available with us are uploaded in website. if you need some thing special you can contact shri hari krishna dujari at geeta vatika gorakhpur up india. Will appreciate if you pls. tell me about pure devotee saints like Sri Radha Baba, Sri Hanumam Prasadji Poddar, Sri Jai Dayalji Goandka and Sri Swami Ramsukhdas ji Maharaj who are preaching now a days. I’m very influenced these saints. dear brother , if i knew , i could have followed them .when we dont know we should pray to dieties who are the only place of solace for us . radhababa had very high regards for few temples like Ladliji mandir barsana ,complete Vrindavan, govind devaji jaipur and many more places . We can also worship the great samadhi of Bhaiji hanumanprasadji poddar and radha baba at Gorakhpur .But I suggest you only to pray at these places , not interact with pujari and pandas and people who are there behaving like spiritual incarnation of these saints. All definitely fraud, who claims like this. the best way is to silently pray and worship and i have firm conviction one day real saint will come to us by His grace.But we have to wait. Thanks a lot for your adv. May Sri Radhakrishna fulfill our emotions soon! Main to baba se bachpan se juda hoon. Main hi nahi mera poora pariwaar baba ka hi kripa patra hai. Baba ne hi mera aur mere agraj bhrata ka naamkarn bhi kiya. Muje naam diya कृष्णमणि aur mere bade bhaai ko apnaa hi raashi ka naam लालमणि de diya. Unki kripa ki baatein agar karne lagoon to na jaane kitna samay lag jaae. Baba ki bahut si baatein mujhe yaad hain. Baba aise sant hain ki unka varnan shabdon mein kiyaa hi nahi jaa sakta. Apne ye website banai jo ki bahut hi sugamtaa se sri baba, sri bhaai ji aur sri poddar ji key baare mein sabko btane me sahayak saabit hoti hai. Apka bahut bahut dhanyaawaad. apka mail padh kar bahut dukh hua. radha baba kyo apne jeewan kal me apne bhai , patni se nahi milana chahte the , iska jawab wo hi de sakte hai . ham log bachpan me unke sampark me the aur itna jante hai ki wo ek kattar sanyasi the. agar galti se koi mahila unka sparsh kar leti thi (jyadatar bhakt unke charan sparsh karne ki koshish karti thi) to wo 24 ghante ka upwas karte the. wo aise bhi ek hi waqt bhojan karte the or sparsh ho jane par chahe wo mata ki umra ki mahila hi kyo na ho ,wo bhojan tyag dete the . unka sharir bahut patala aur adhik swastha nahi tha parantu wo kahte the sanyas ka adarsh rakhana chahiye . wo rupye ka sparsh nahi karte the aur galti se paisa touch ho jaye to 24 ghante ka upwas karte the . Unhone isiliye kisi ko bhi sanyas ki diksha nahi di .koi shishya nahi banaya aur wo apni kabhi tasvir nahi khichate the . unhone kabhi sapne me bhi nahi socha tha ki unka koi mandir banega . yeh website kisi mandir ka prachar nahi karti ,koi chanda nahi leti , kisi ko chanda dene ko kabhi nahi kahti aur mera pura vishwas hai ki unka koi adhyatmik varis nahi hai . jo log unka nam lekar kuchh karte hai wo apni marji se karte hai .Agar wo thag hai . atyachari hai to radha baba ka koi desh nahi hai . Log bhagwan ke nam par bhi dushkarm karte hai . Ham log radha baba ke bache the , manas putra the ,kyo ki ham unhe apna mante the , hamara unhone palan poshan kiya , hame itna pyar diya jitna ma bap bhi kam hi karte hai . isliye ek farz ke nate hamne ye kitabe website me daali hai . Agar ap iska fayada utha sakte hai , unke jeewan se kuchh achhi cheeze sikh sakte hai to hamara parishram safal hai . Nahi to kripya is website ko mat dekhiye . Radha baba ke bhai andhe the ,honge. par wo bahut hi nek insan the . ham unhe bachpan me milate the aur sare bhakto ka jeewan dekhiye unke pariwar wale bahut peeda ke sath jeewan jiye. Bhagwan krishna ke mata pita jail me the. Isse ap kya kahna chahte hai mahashya. Ki isliye radha baba mahan nahi the , yeh apka bhram hai . Koi bhi sanyasi apni patni se nahi mila , ha ma se radha baba bhi sanyas ke bad mile the aur anya sanyasi bhi mile the kyo ki isme unki anumati thi. 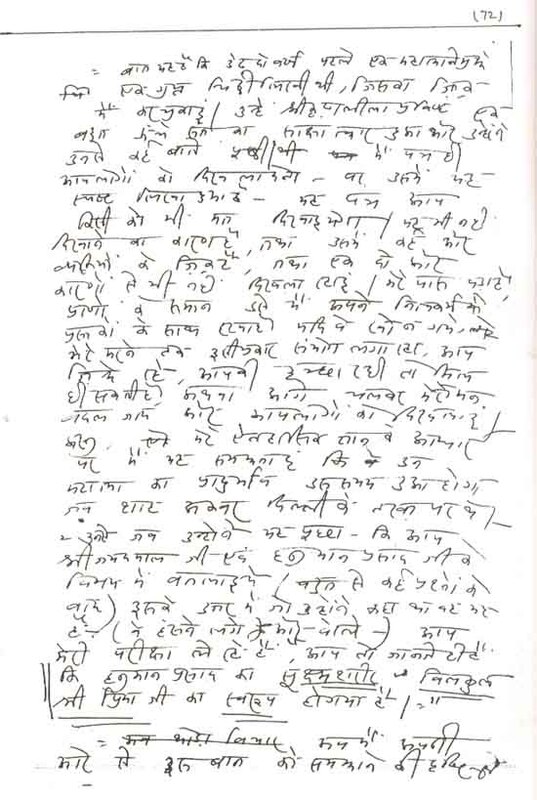 Radha baba ke jeewan ke bare me vyakshya karne ka mujhe haq nahi hai . lekin itna pura vishwas ke sath kahta hu ki unke jeewan kal me unhone kisi chinti ,keede ko bhi kasht nahi diya. Wo pyar ke sagar the . Unhone paise ko kabhi mahatva nahi diya .Warna ham log jo garib the aur hamare jaise hazaro log the kabhi unke sampark me nahi ate. Radha baba kahte the ki sant ke nam par agar koi bura karm karta hai to uska parinam hazar guna jyada bhogna padata hai . isliye ham sabhi se prarthana karte hai ki radhababa ke adarsho par chale. Ham is website ke madhyam se bhi appeal karte hai ki radha baba aur bhaiji ke nam par chanda dene se pahle nishchit roop se janch le ki apka paise ka sadupyog ho raha hai ya nahi . You are right prabhu ji…if we can read the Bio graphy of his grace chiatnya Mahaprabhu … he was living the same life style . His saint life was the same .he never saw his wife ..his mother could see him very rarely after he became the saint . I have never seen Baba, Bhai ji .Seth and swami ji but after reading their books i feel that they are my everything .How can a person can right such tough statement about a saint . First they should look that how they are behaving with their family memebers . 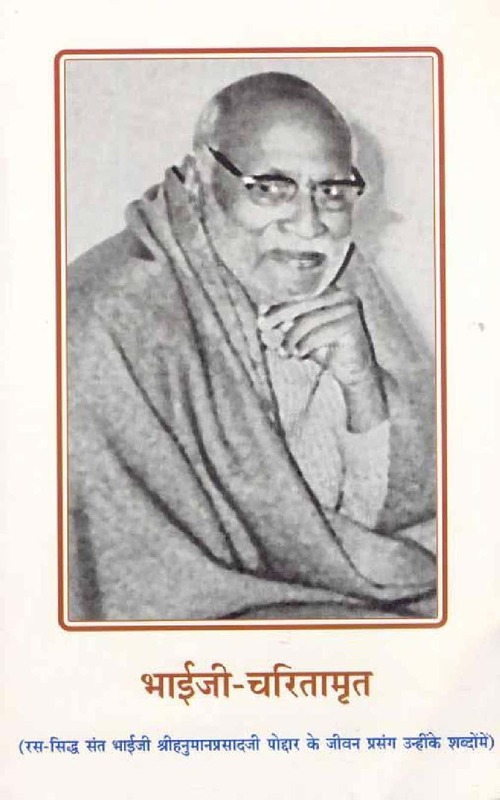 Param pujya Radha Baba is my Nanaji. I am very much glad to see this site.He is Nityaleelalin but i feel his presence everywhere.i spent my childhood at Fakarpur and felt Baba everywhere in each and every deeds of my family. 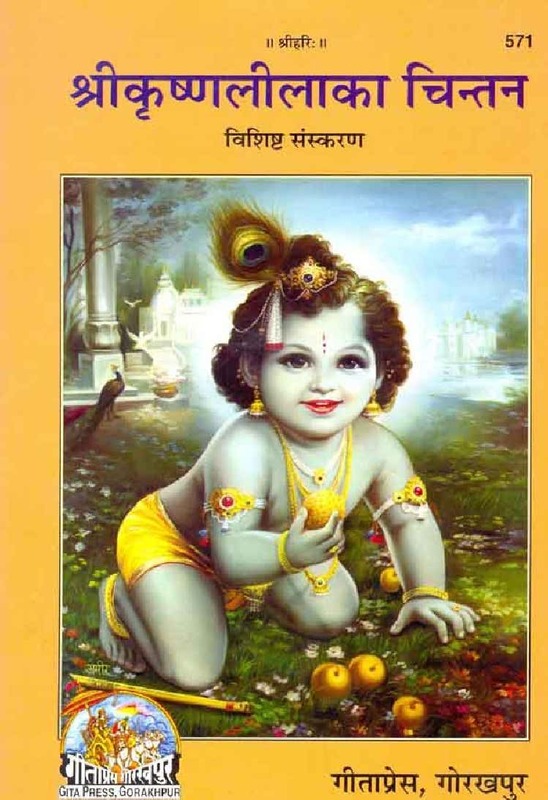 Last year in 2011 we celebrated Janamasthmi in GEETA VATIKA. This year we are planning for RadhaASTHMI, hope we can able to make it. I was searching for videos of Janamasthmi celebration from Geeta Vatika. 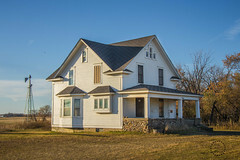 I with my family were so much desperate for this search, while searching i found this site. Really felt so good Thank you for creating this. My humble request to you is if possible upload videos of celebration of festivals in Geeta Vatika, it will also help us in DARSHAN of Baba, Bhaiji Bhagatji and Devotees giving there offering and we can refresh our memories by looking the great people around Vatika. Radha Baba is a Avtar of Radha Rani. He is a strong and powerfull saint of kalyuga. Bajoria is fully devoted bhakt of baba. I’m really very unlucky, I miss the opportunity to meet them…….